CDISC Express supplies relative rich sets of data manipulation techniques assembling with SAS languages used for data mapping. Following is a not limited listing and I will keep it updated. 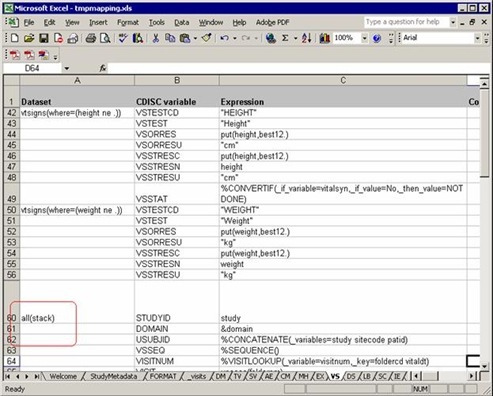 A raw dataset name appear in “Dataset” column indicate a “set” operation in SAS. There is a macro %cpd_importlist used to import the external dataset, “_visits”. Again, this macro roots in C:Program FilesCDISC Expressmacrosfunction_library. Using a macro call to re-sharp or modify an input dataset offers great flexibility referencing data. We will also discuss the benefits later on. You can assign a number, string and a dataset variable with any valid SAS functions to a SDTM domain variable in “Expression” column. Sometimes a temporary variable needed for later calculation. 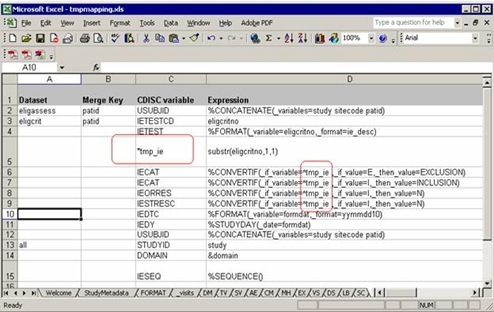 You can produce such temporary variable in “Dataset” column with an assignment in the “Expression” column just similar with any other domain variables. Two differences: first, such temporary variables named begin with an asterisk, “*”; second, all temporary variables will not be included in the final domain. Once created, such temporary variables can be used for any other expressions. Tilde, “~” : indicate a variable used for supplemental domain (SUPPQUAL). Number sign, “#”: indicate a variable used for comments domain (CO). We already got a math-merging example before. 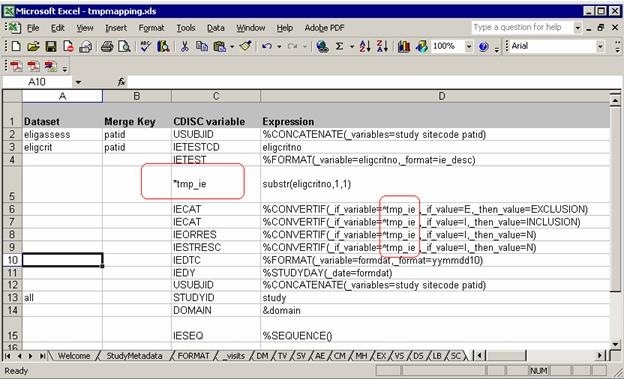 If “all” appears as a dataset in the “Dataset” column, all the previous datasets should be merged first for later processing by the common key specified in “Merge Key” column. If no key assigned, patient ID is used by the system. 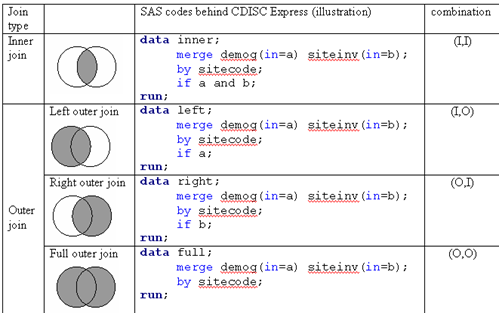 CDISC Express also supports two types of join, inner join and outer join (left, right, full) using data steps. The implementation has slightly difference with standard SQL, but the ideas are same. We add a new column, “Join”, usually beside the “Merge Key” column. 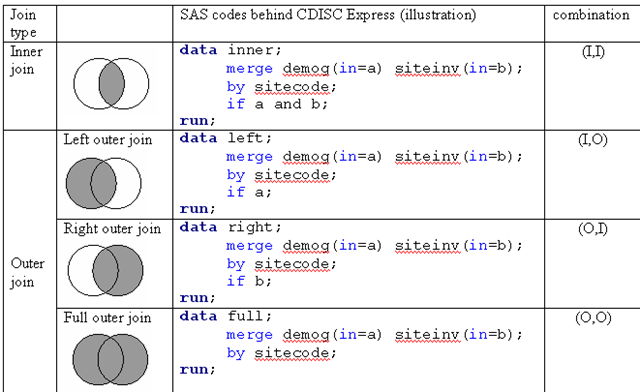 As we could see, if no “Join” column specified, CDISC Express will perform inner join by default. The developer Romain indicated that such enhancements would be raised to the next round of product road map and he also proposed a work around. To use multiple keys for merging, we can create a temporary variable holding such multiple keys as a concatenation then this temporary variable can be used as a single merging key. Above we discussed lots about “merge” operation in CDISC Express. This section dedicated for “set” operation. We already know how to “set” one dataset for referencing, but how to “set” multiple datasets, i.e, “Concatenating”? Clinical SAS programmers do lots of transpose operation to re-sharp the raw data to fit the CDISC standards. Currently there is no explicit guide in CDISC Express on how to transpose, but this is not the end of story. As good practices, in SAS we always use data steps with “output” statement to perform type I transpose and use PROC TRANSPOSE for type II. Although CDISC Express doesn’t support transpose operation in an explicit way, at least you can perform type I transpose and surprisingly we already saw it before! 4.3.6 All others: use macro! Now we discussed almost all the common data derivation techniques in programmers’ daily life and the corresponding implementation in CDISC Express. At least we have one question unsolved: how to perform type II transpose, i.e. from a long table to a wide table? It would be an open question for the developers of the application. But we can also solve this problem in current framework: use macro, customized macro. You can use macros in “Expression” and “Dataset” column. Macro used in “Dataset” column returns a dataset, while macro in “Expression” column returns series of string: that’s the basic structure you should consider when customize your own macros. For more, you can reference the macros in <b>C:Program FilesCDISC Expressmacrosfunction_library</b>. 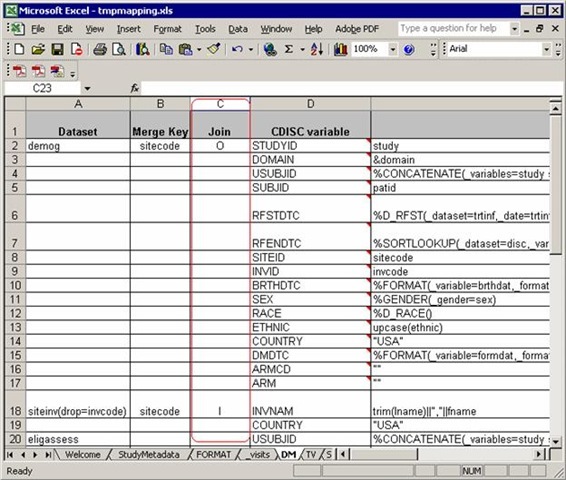 For example, <font color="#ff0000">&concatenate</font> used in “Expression” column; <font color="#ff0000">&cpd_importlist</font> in “Dataset” column. The raw data varies according to trial design and clinical data capture system and procedures. It is impossible and impractical to anticipate the CDISC SDTM converter such as CDISC Express to map all the data just clicking a button. The introducing of CDISC Express doesn’t keep programmers away. It just keeps most of the trivial work away from programmers’ daily life and let them more concentrated on creative work and be productive and efficient. Following would be the close of such pages.